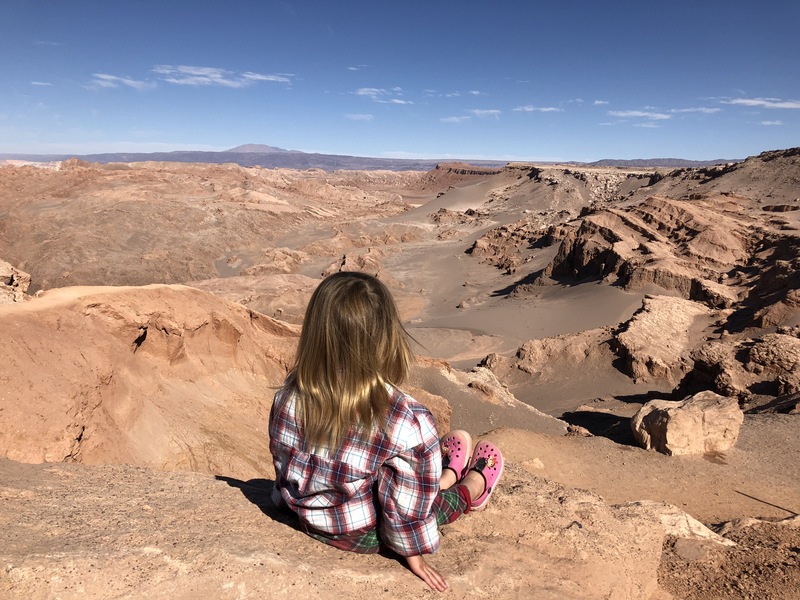 I first learned about the Atacama desert when I was selecting a destination for my vacation several years ago while I still lived in LA. I had to choose between Chile, Fiji and Malaysia. 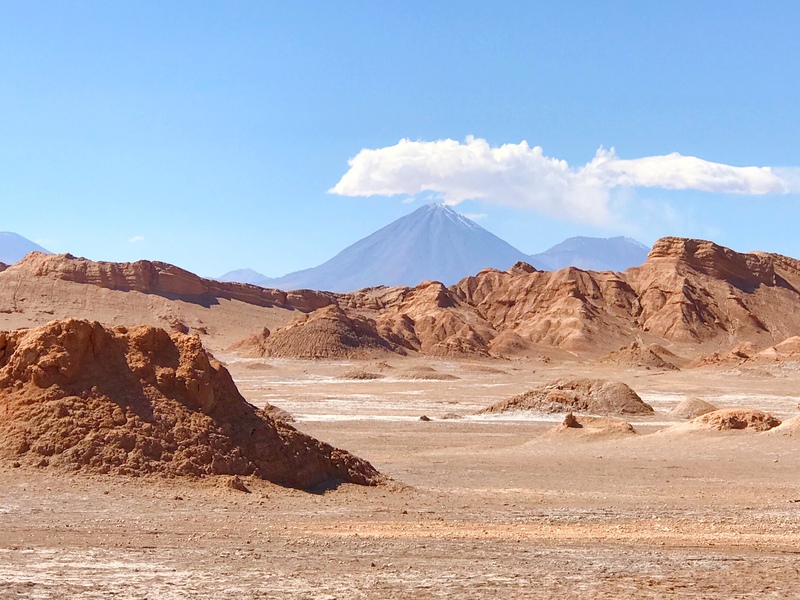 I ended up going to Malaysia and Singapore hoping that some day I would get to explore Chile and its desert in the northern part of the country. 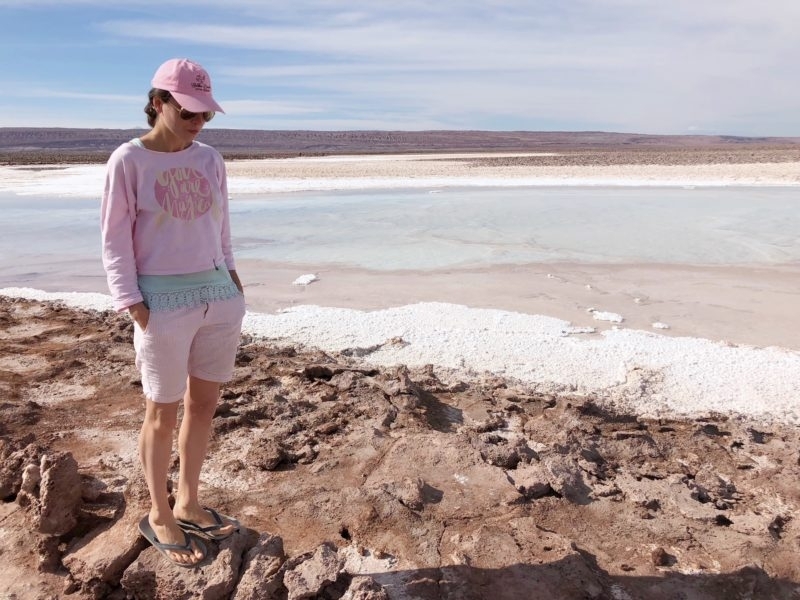 5 years later another travel dream became a reality and I visited not only Atacama, but also many other parts of this long and narrow South American land called Chile. 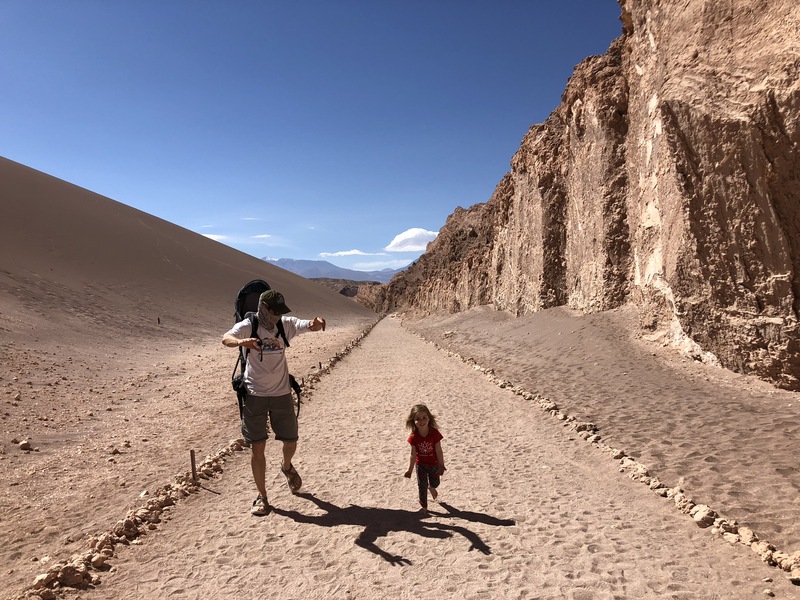 After being on the road for over three weeks in our minivan we arrived in the dry, dusty high altitude desert of Atacama. There wasn't really any specific point of arrival into the desert itself as we had already been driving through it for days with no end of it in sight. 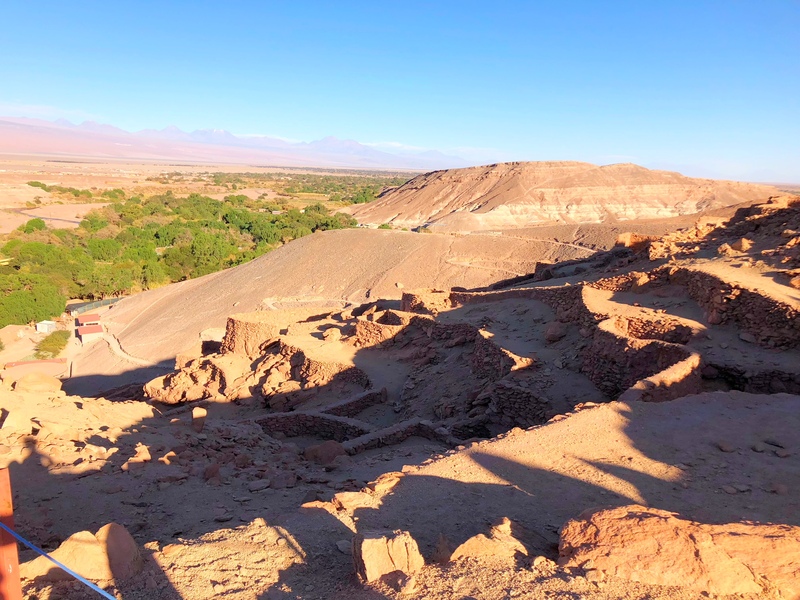 I guess what I mean by our arrival is finally reaching the small village of San Pedro de Atacama which serves as a local tourist hub for main points of interest, some of them rather close to the village and others quite far. 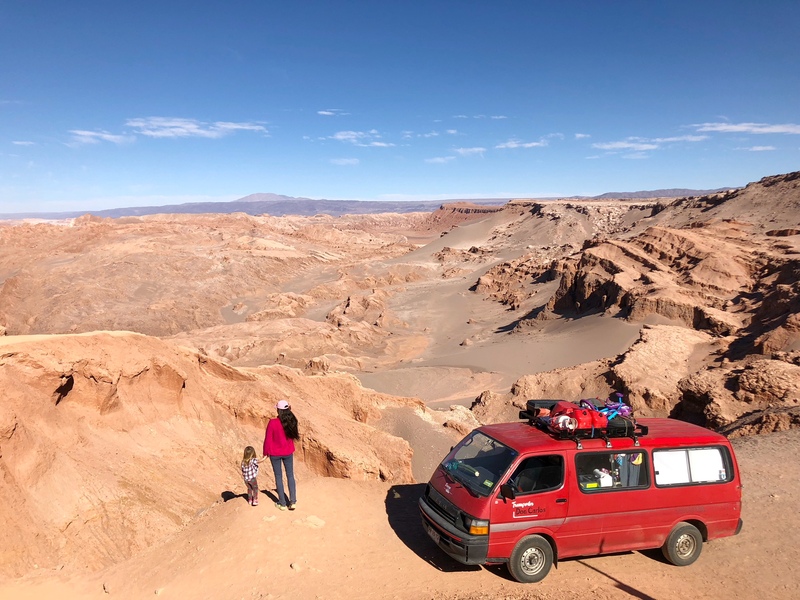 On the first day we went to explore the Moon Valley (Valle de la Luna), a trip that we made by car which took us about 3-4 hours. Every 2-5 km on a road going through the valley there are stops with different attractions. 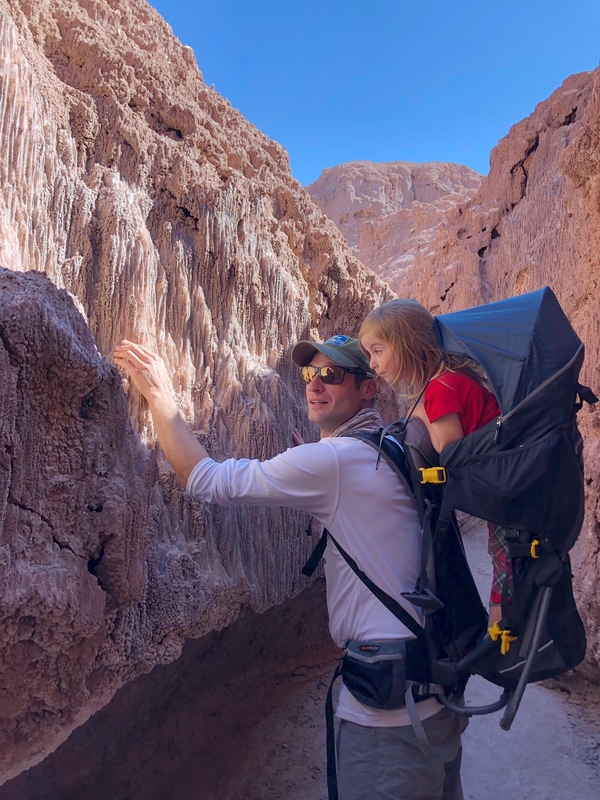 We went to one canyon that by its formation resembles Antelope Canyon in Arizona. Starting as a canyon it later turned into a dark cave. 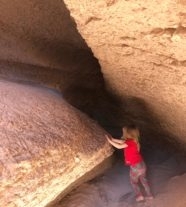 We also hiked to a grand sand dune and a rock formation called the Amphitheater. There were some other tourists from different countries mostly riding their rental bikes in the southern hemisphere's winter heat. I imagine it's nearly impossible to do in the summer. After a quick lunch in one of the local food joints next to the Feria Artesanal (market with crafts) of San Pedro de Atacama and Aya’s quick nap we visited Pukara de Quitor, archeological ruins of native atacameños located on top of a hill overlooking the town, valley and multiple volcanos in different directions. After that sight we were tired and ready to rest. Prior to coming to Atakama I had carefully selected the attractions that I wanted to visit. 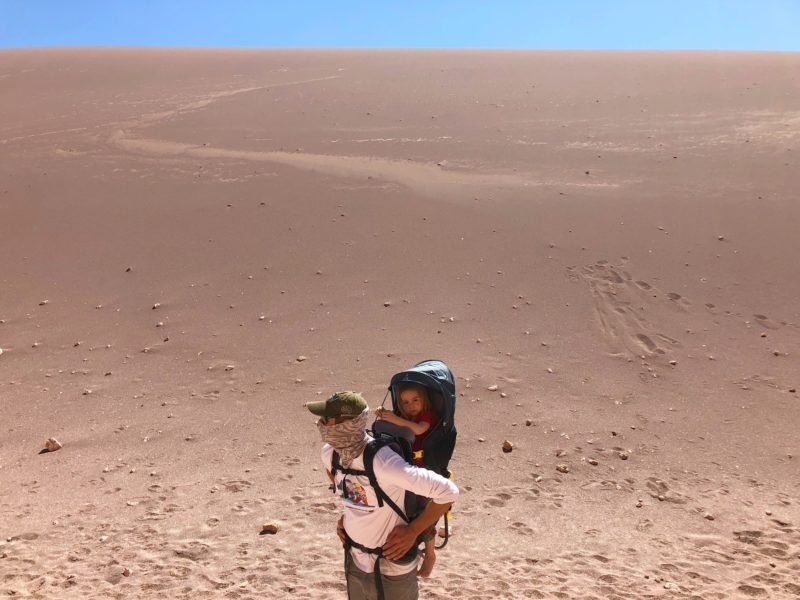 I wasn't sure however whether we were going to make it to all of them or not based on their proximity to town, the (terrible) road conditions requiring a 4*4 vehicle, and our own well being, mostly thinking about our child, of course. I was surprised that she didn't seem to be affected by the altitude (over 3000+ m above sea level) nor the extreme dryness of the air. At certain points though Justin and I were overwhelmed by the heat, allergies, dust (that could literally be tasted in the mouth), and some headaches now and then. At the end of the first day we found out from the local people that we might not be able to reach some destinations from my list in our vehicle. 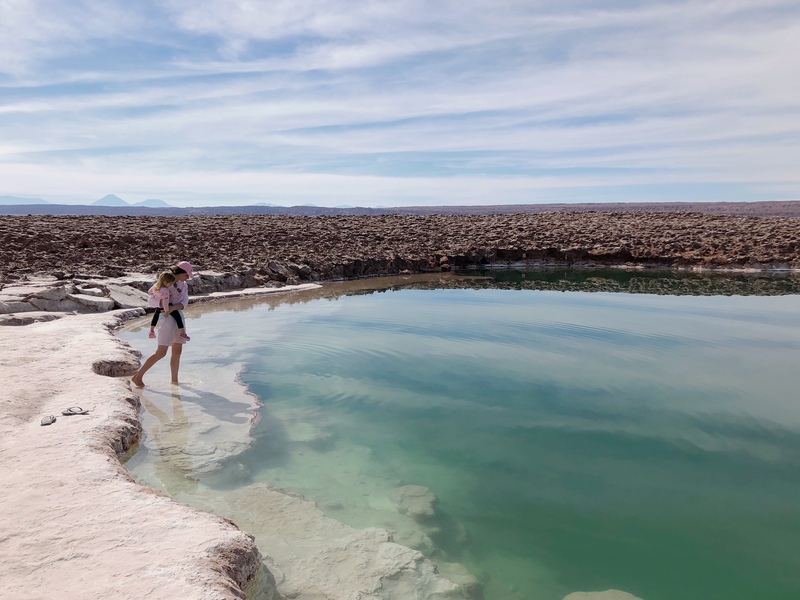 Also the decision has been made not to go to El Tatio geyser located high(er) in the mountains, 90 km north of San Pedro. I was ok with that. The remaining sights that were still within our reach gave us a good picture and understanding of topography, geography and geology of the area. 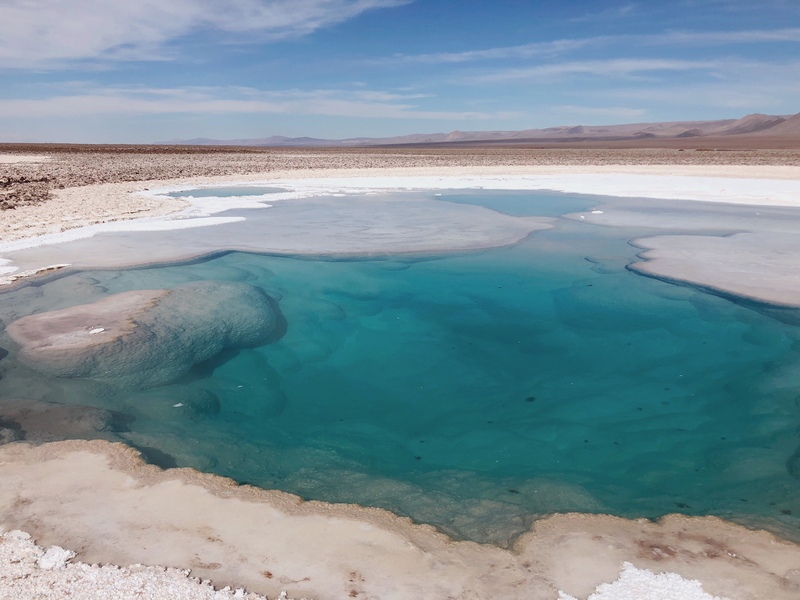 In the morning of our second day we drove about 20 km to Laguna Cejar, a lagoon located in the Salar (salt flats) de Atacama. 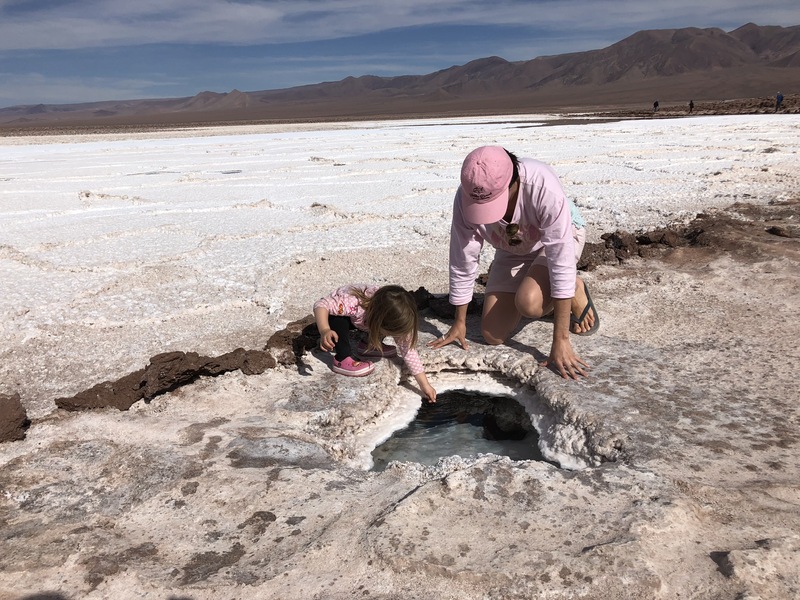 We needed to pay $25 per person just for the entrance, but learned on the spot that it wasn’t worth it and instead drove to the Laguna Tebenquiche just 14 km away from there. The entrance fee there was less than $3.50 per person and we enjoyed a long walk along the shore of the lagoon watching flamingoes and tasting salt as we moved from one side of the lake to the next. Aya first stayed in her Deuter carrier, but on the way back toward the parking lot she decided to walk. 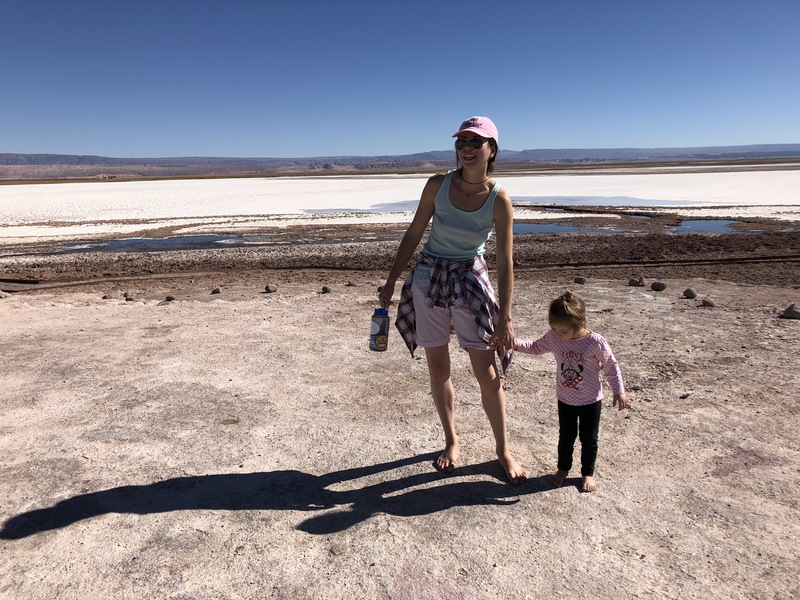 She and I walked barefoot and stopped at different points to look at the formations of the lagoon and to explore salt crystals of various shapes and forms. 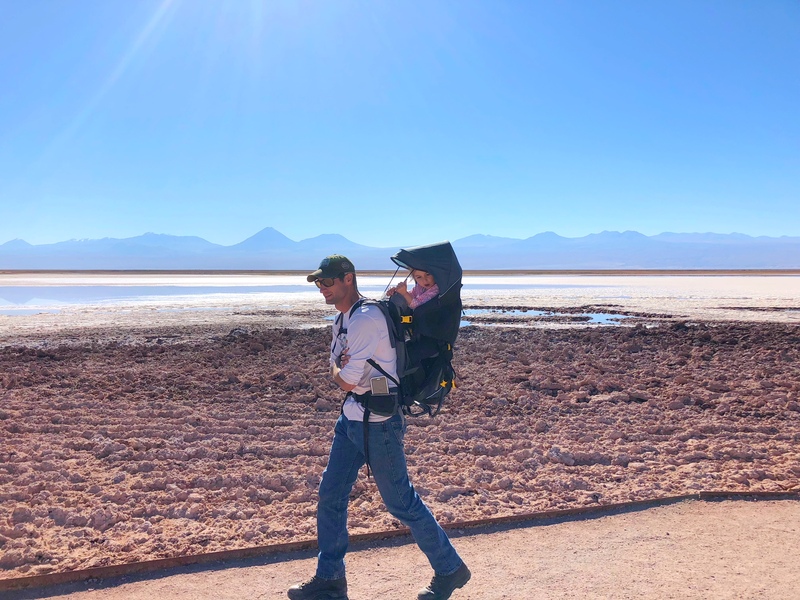 We very much hoped that Aya was going to take a nap when we slowly drove back to San Pedro, but it didn't happen. 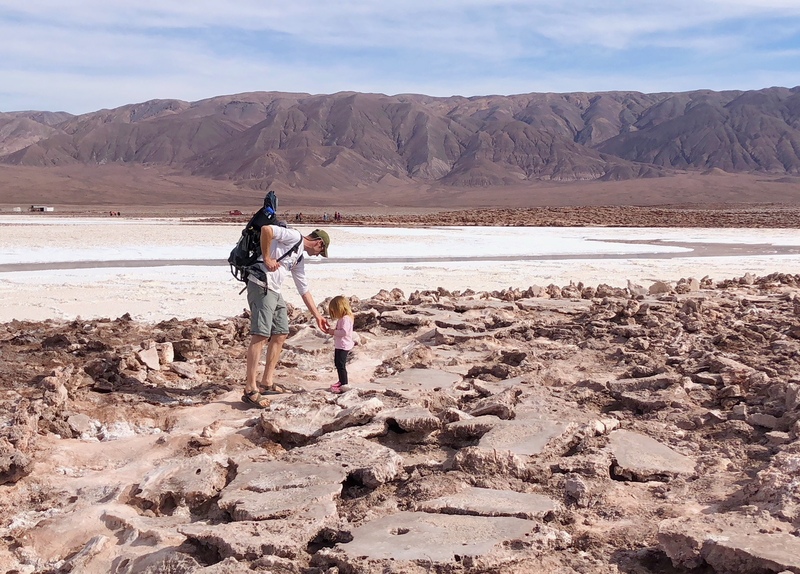 For the afternoon we decided to make the trip to Termas de Puritama (hot springs), about 20 km North of San Pedro on the road that goes to the El Tatio Geyser. We gained more elevation approaching the hot (in this case just warm) springs and it was also going to be a test whether we were up for more altitude and longer distance to actually make it to the geyser the following day or not. 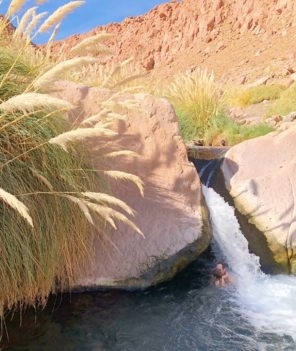 By about 3 pm we were all splashing in the lowest of the 7 pools of Puritama Springs. The water temperature was very pleasant, but once out, the body was covered in goosebumps due to the strong wind. Nonetheless we ran from one pool to the next swimming in as many of them as possible. Aya obviously had a blast learning to stay afloat and jumping in water. Puritama Springs are located in the canyon and once the sun was setting down it was time to get out in order not to get cold. We ate snacks while driving downhill back to San Pedro. Close to town we gave a ride to a local atacameña lady who was walking along the mountain road since 10 am!!! We were surprised that noone had stopped to give her a ride. 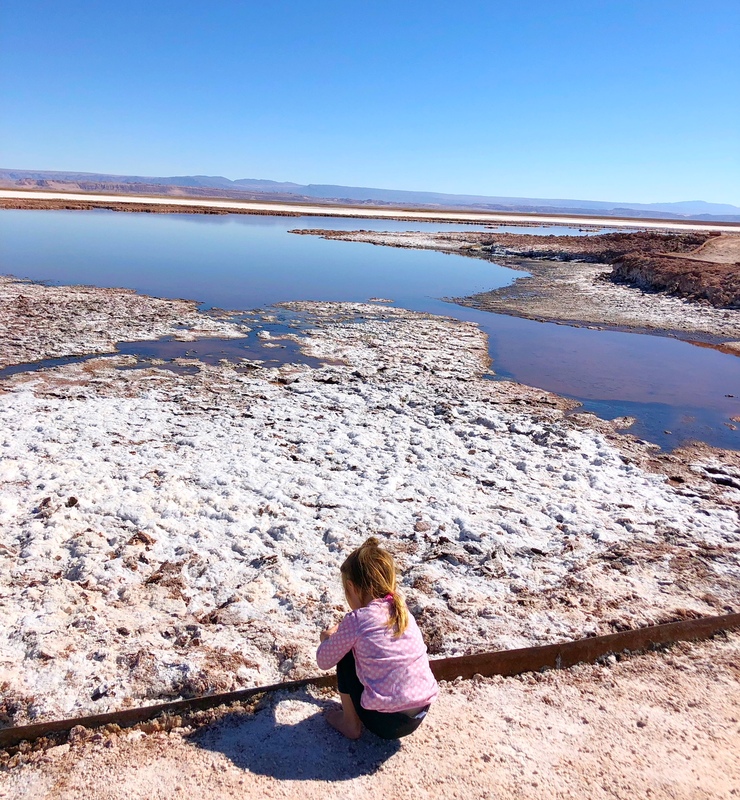 After dropping her off we continued with our route in the direction of Calama, made a left turn onto a local extremely dusty washboard road and reached our final destination in Atacama, Lagunas Escondidas de Baltinache (Hidden Lagoons of Baltinache). We knew that the place was closing for the public at 6 pm and as we were getting near it the guards and other employees were leaving for the day. One of them asked us what we were going to do and told us that we couldn't enter outside of working hours and that a guard was supposed to show up at night to check on us. Yeah, right! We basically rolled our eyes, but responded that we would camp by the place overnight and then enter once the employees arrived in the morning. And so we did. Before going to sleep though we all went outside of our ‘home’ to look at the stars and the Milky Way galaxy. Watching shooting stars and the night sky in the desert away from any light pollution was fantastic. 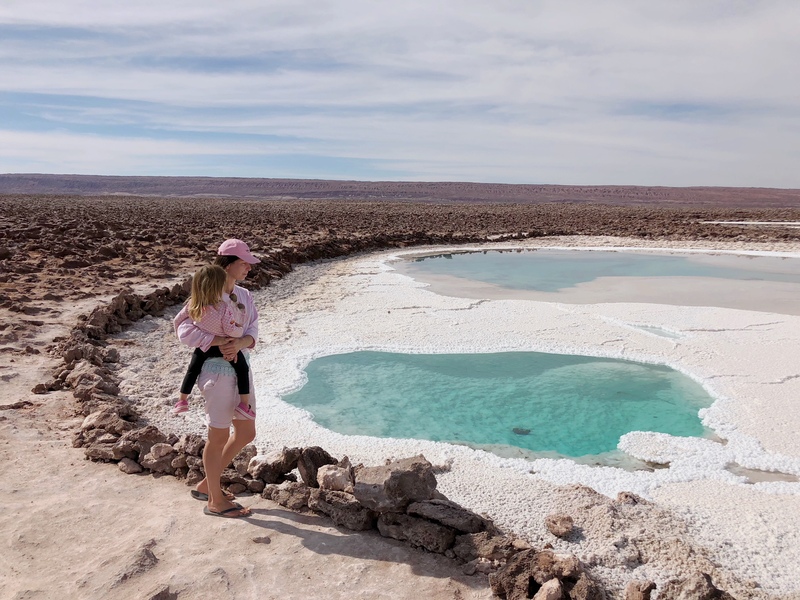 On the next (our last) day in the surroundings of Atacama we saw the real gems of the desert, the breathtakingly beautiful seven turquoise lagoons filled with salt water and the crystals and rocks around their shores. 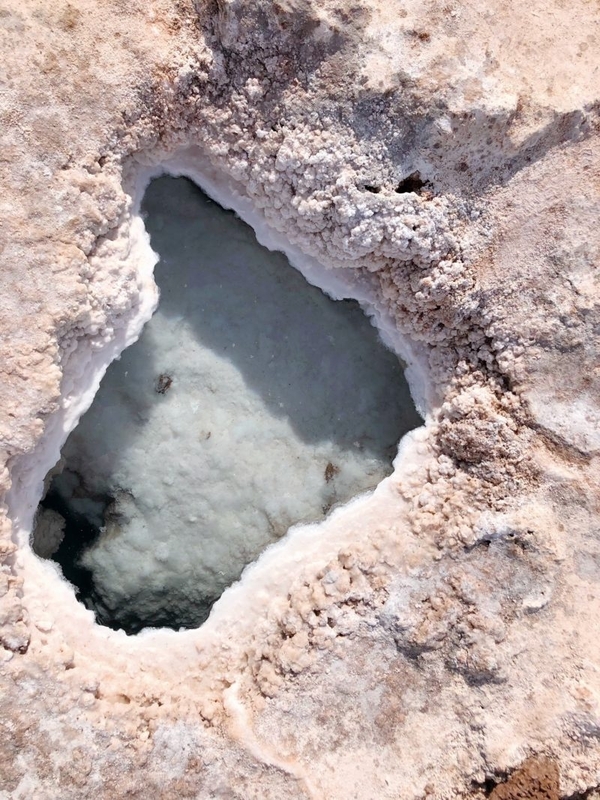 I have seen salt lakes and salt flats in Salt Lake City and Russian Sol Iletsk not far from the Kazakh border, but this was a totally different level of Pachamama’s creation. Swimming was allowed in first and last lagoons, leaving the other five in between just for observation. I think we took that beauty in as much as we could. 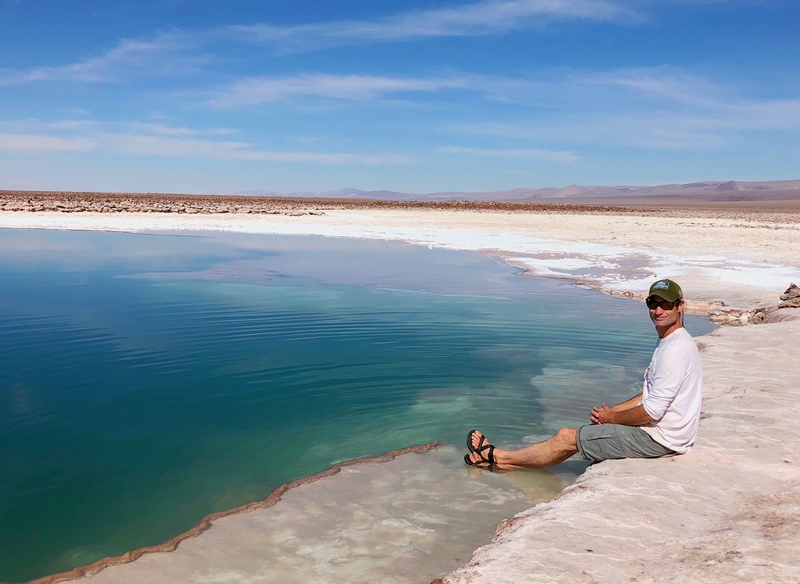 We soaked our feet in the last lagoon, but decided not to swim, even though the place had bathrooms and showers with cool water. 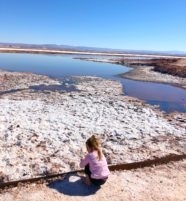 We were surprised to see dead, but well preserved butterflies covered in salt crystals along the shore. Then all of a sudden a dragonfly landed on Justin’s white shirt that later decided to immerse itself in the salt water of the lagoon. What were those creatures doing there? With no fresh water or any plant life in sight for about 40 to 60 km it was puzzling to us to see these insects. 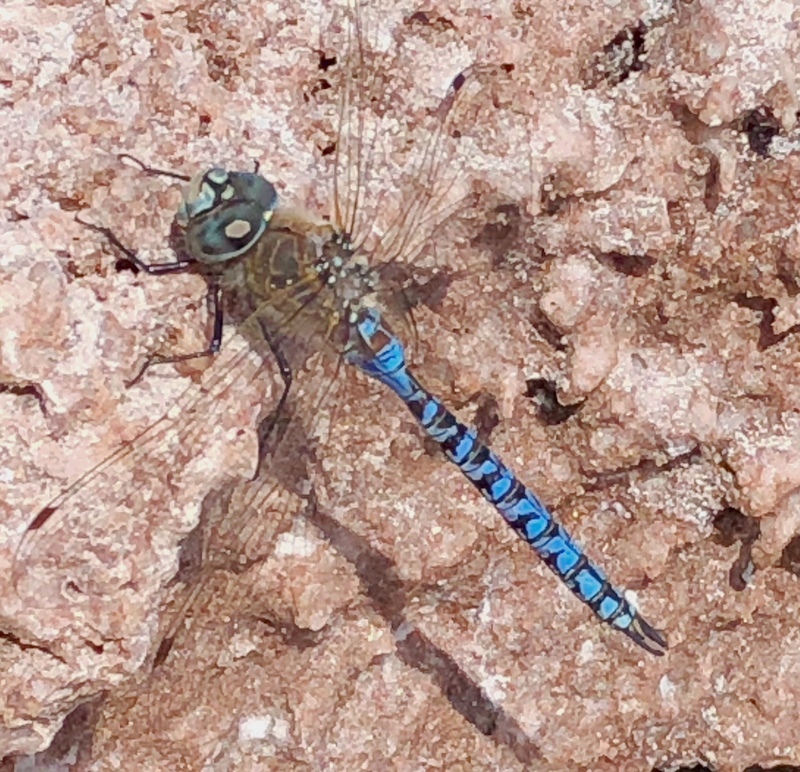 It became clear that the dragonfly was drowning in the salt water and Justin pulled it out and rinsed it with our drinking water from the Nalgene. 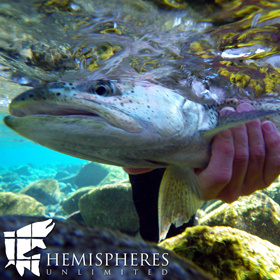 We took it to our van and decided that we would let it out back in Calama which has a river flowing through town. It was almost noon and the air got really hot again as we drove back on the washboard road going close to 90km/h and inhaling dust along the way. 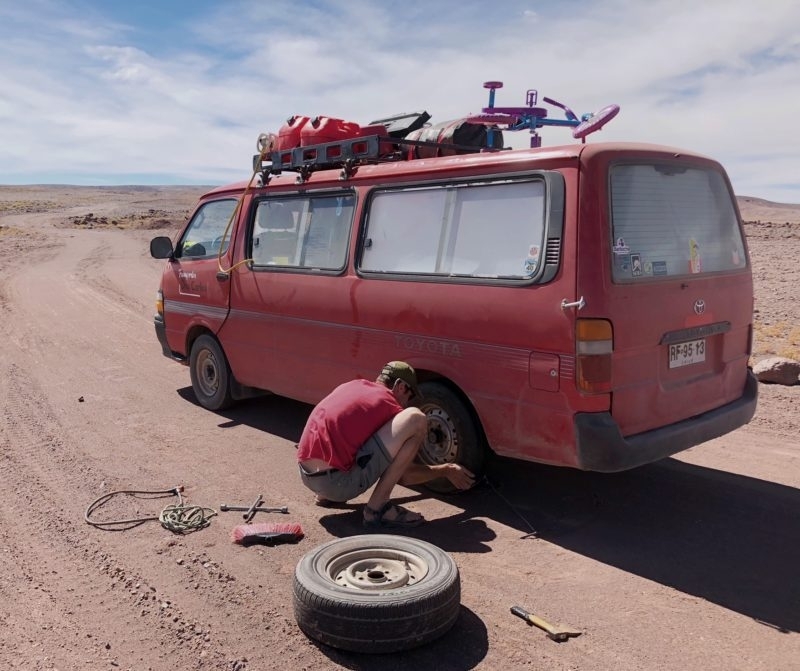 As we reached the main highway and traveled some miles away from San Pedro de Atacama we stopped for a pee break noticing that one of the tires was going flat. The stop took longer than originally planned; Justin changed the tire and I fixed a quick lunch. 80 or some km later we were back in Calama looking at the map and figuring out the future route. 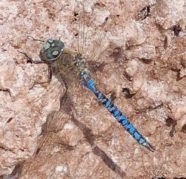 The blue dragonfly was released by the river. Я узнала о пустыне Атакама несколько лет назад, когда выбирала очередное место назначение для отпуска. Тогда мне нужно было выбрать между Фиджи, Чили и Малайзией. В итоге я поехала в Малайзию и Сингапур. Спустя 5 лет в этом году мне посчастливилось увидеть не только Атакаму, но и много других мест этой узкой и длиной страны под названием Чили. Проезжая по стране в нашем минивэне на протяжении трех недель, мы наконец прибыли в Атакаму. Точнее точки прибытия как таковой у нас не было потому что мы ехали через пустыню много дней и было ощущение, что она никогда не закончится. То, что я имею в виду под словом «прибытие»- это въезд в деревеньку Сан -Педро- Де -Атакама, которая служит местным туристическим хабом. Из Сан-Педро проводятся много экскурсий на местные достопримечательности в разных направлениях. В первый день мы отправились исследовать Валье-де-ла-Луна (Лунную Долину). Поездка по долине заняла около 3-4х часов. Примерно каждые 3 км мы останавливались, парковались и подходили ближе к каньонам, один из которых напомнил о каньоне Антилопы в Аризоне; пещерам, дюнам и интересным фигурам из глыб искусно выложенных самой природой. По пути мы встречали туристов из разных стран, в большинстве- французов на арендованных велосипедах. Пообедали мы в одном из местных кафе около базарчика с сувенирами, а после дневного сна Айи поднялись на гору Пукара-де-Китор. Пукара означает крепость, которая была построена в доколумбову эпоху, датируется 12 веком и в данное время считается национальным монументом Чили. С вершины археологического комплекса открывается вид на долину с вулканами и поселение Сан-Педро. Спустившись с горы во время заката мы настолько устали, что готовы были сразу лечь спать. Перед приездом в Атакаму, я досконально изучала места, которые нам стоило бы посетить. Я не была уверена получиться ли у нас добраться до всех в моем списке по следующим причинам: расстояние, ужасные дороги и соответственно низкая скорость (20-40 км / ч), наличие/ отсутствие полного привода, и наше самочувствие. Больше всего я думала о самочувствии Айи ведь резко сменилось атмосферное давление, влажность воздуха заменилась на сухость, и ездя по горам и вулканам наша высота над уровнем моря то поднималась то резко опускалась. На удивление, ни один из этих факторов никак не отразился на нашем ребенке, а у нас самих и голова успела разболеться и появилась аллергия на пыль и грязь. В конце первого дня мы узнали от местных, что у нас может и не получиться доехать до некоторых место назначений из моего списка. Также, по ходу дел мы решили не ехать на гейзер Эль Татио высоко в горах в 90 км езды от Сан-Педро. Достопримечательности оставшиеся в списке все равно позволили нам понять географию, геологию и топографию той местности. Утром второго дня нашего прибывания в Атакаме, мы проехали около 20 км до соленой Лагуны Сехар, находящейся на солончаке Салар-де-Атакама. Мы должны были заплатить $25 за человека чтобы посетить это место. Доехав до въезда мы узнали, что посещение Сехар того не стоит и проехали еще 14 км до Лагуны Тебенкинче. Плата за вход здесь была намного ниже, $3.50. Мы запарковались около берега лагуны и пошли по специально отведенной дорожке вдоль берега, наблюдая за фламинго и пробуя соль двигаясь от одного интересного местечка к другому. Айя сначала сидела в рюкзаке Deuter на спине Джастина, а на обратном пути шла сама. Мы вдвоем шли босиком и часто останавливались, чтобы изучить и пристально посмотреть на разные формирования солевых кристаллов. Мы очень надеялись, что Айя уснет на обратном пути по дороге в Сан-Педро, но этого не случилось. После обеда мы решили поехать в термальные источники Термас-Де-Пуритама, 20 км на север от Сан- Педро по горной трассе ведущей к гейзеру Эль Татио. Мы набрали высоту приближаясь к теплым источникам. Для нас это также послужило тестом если мы были готовы подняться еще выше , чтобы доехать до гейзеров на следующий день. К 3 м часам дня мы уже плескались в самом низком бассейне источников Пуритама. Температура воды была очень приятной, но при выходе из воды тело сразу покрывалось мурашками из-за сильного ветра . Тем не менее мы перебегали из одного бассейна в другой. Айя была в восторге от плескания и плавания в столь теплой воде. Источник Пуритама наxодится в каньоне, поэтому как только зашло солнце, стало сразу холодно и мы выбрались из воды. Спускаясь по трассе ведущей в Сан-Педро мы быстренько перекусили и подобрали по пути пожилую местную жительницу, идущую в город по этой горной дороге с 10 утра. Нас очень удивило, что никто ее не подвез, ведь машины и автобусы с туристами ездят по этой дороге достаточно часто. Высадив её в нужном ей месте мы продолжили ехать по направлению к Каламе, чуть позже свернув влево на очень пыльную земляную дорогу. После 40 км тряски и поедания пыли мы наконец прибыли на наш последний пункт назначения в Атакаме- к Лагунам Балтиначе. Мы знали, что место закрывалось в 18 вечера. Подъезжая ближе к лагунам мы увидели как охранники и другие работники возвращались обратно в город. Один из них спросил, что мы собираемся делать и сказал, что мы не можем посетить лагуны в нерабочее время и, что охранник должен прийти ночью и проверить если мы послушались. Ага! Мы с Джастином оба закатили глаза от сказанного им абсурда насчет охранника, но пообещали, что не пойдем посещать лагуны до того как не приедут работники с утра. Так мы и сделали. Перед сном мы все вместе вышли на улицу и уставились на ночное небо. Айя принялась считать звезды, а я все не могла оторваться от млечного пути, при этом наблюдая за падающими звездами. На утро следующего дня мы увидели настоящие драгоценности пустыни, 7 соленых бирюзовых лагун от красоты которых захватывало дыхание. Я и раньще видела солевые озера в американском Солт Лейк Сити и российском Соль Илетске, недалеко от границы с Казахстаном, но это зрелище было действительно другого уровня. Плавать было разрешено в первой и последней лагунax, а на другие пять можно было только смотреть с отведенных тропинок возле берегов. Думаю, мы насладились красотой этого места настолько насколько могли. В последней лагуне мы зашли в воду по колено и решили полностью не купаться, хотя на входе стояли душевые кабины с холодной водой для ополаскивания после купания. Нас очень удивили мертвые, но идеально сохранившиеся бабочки лежавшие в соли на берегу. Откуда ни возьмись, стрекоза приземлилась на белую рубашку Джастина и позже решила окунуться в соленой воде. Mы пытались понять, что в этой местности делают стрекозы и другие насекомые, ведь наличие пресной воды и растений не было видно в пределах ближайших 40-60 км от этого места. Стало ясно, что стрекоза стала тонуть. Джастин достал ее из соленой воды и сполоснул питьевой водой из нашей Nalgene. Мы решили принести ее в вэн и отпустить возле реки в городе Калама, куда мы позже направлялись. Наступил полдень и было очень жарко, когда мы уже ехали обратно по пыльной дороге. Достигнув асфальтированной трассы и проехав несколько миль мы остановились слить нужду и заметили, что одно колесо быстро сдувалось. Остановка оказалась длительнее, чем мы планировали. Джастин заменил колесо, пока я готовила ланч. Через 80 км мы уже были в Каламе и смотрели на дорожный атлас Чили обсуждая будущий маршрут. Стрекоза, вымытая от соли была отпущена возле реки.